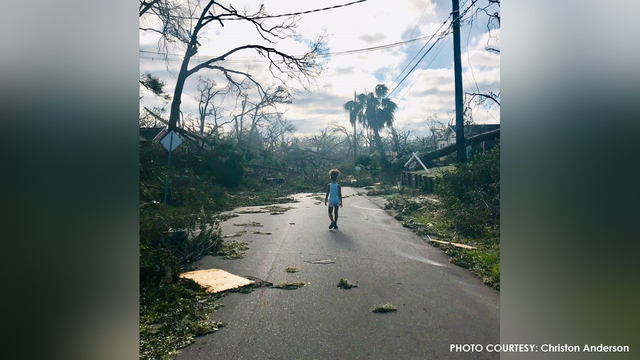 PANAMA CITY, Fla. (NEXSTAR) - On Wednesday, Oct. 10, 2018, Hurricane Michael made landfall in Florida as a powerful Category 4 hurricane, just shy of reaching Category 5 status. The massive storm brought intense winds, heavy rain and life-threatening storm surge that wreaked havoc along the Gulf Coast of Florida before moving inland. 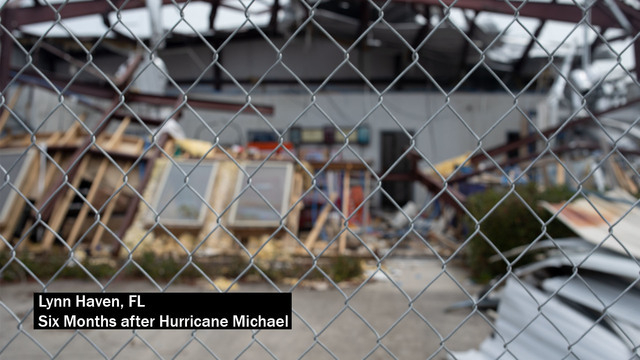 Michael left death and widespread destruction in its wake, devastating several counties in the Panhandle before heading north. Those who survived the storm lost their homes, their possessions and their jobs. Buildings, businesses and roads were destroyed. Now, six months later, people living in the areas hit hardest by the hurricane are still working to pick up the pieces and rebuild what the storm destroyed. Survivors in the Panhandle say they feel alone, like they have been left behind and forgotten by the rest of the country. Six months after the storm, they have a message for everyone: "We’re still here." Hurricane Michael slammed into Mexico Beach in the Florida Panhandle around 1:30 p.m. on Oct. 10, 2018 with sustained wind speeds of 155 mph. Michael was a powerful Category 4 storm at landfall, just 2 mph short of reaching Category 5 status on the Saffir-Simpson Hurricane Wind Scale used by the National Hurricane Center. "It was rough. It sounded like a freight train going on top of the jail," Bay County Jail Warden Maj. Rick Anglin said. 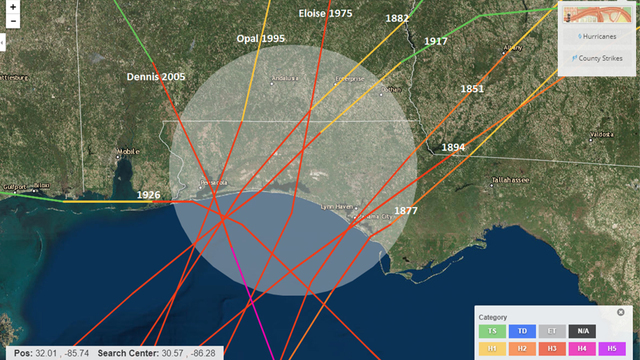 Data from Hurricane Hunters and radar shows Michael was still intensifying at landfall. "We were having to move from room to room in the police station after the ceiling was collapsing and water was coming through," Panama City Police Officer Shannon Chaix recalled. Based on wind speeds, Michael was the fourth-strongest storm to ever make landfall in the continental United States. According to the National Weather Service, the continental U.S. has only seen 24 Category 4 hurricanes since 1851. Only four of those, including Hurricane Michael, made landfall in October or later. Michael was the third most intense storm on record by minimum central pressure with a measurement of 919 mb at landfall. The National Weather Service recorded peak storm surge inundation at 9 to 14 feet from Mexico Beach to Indian Pass. Rainfall in some areas of Florida reached 6.66 inches and flooding was recorded in several counties. Michael was the strongest hurricane to ever make landfall in the Florida Panhandle. Before 2018, the Panhandle had only ever seen nine other major hurricanes. Five months after the hurricane, the storm name Michael was retired by the World Meteorological Organization. Storm names are retired if a storm is so deadly and destructive that using the name again in the future would be insensitive. Entire blocks of homes were washed away by storm surge and wind from Michael. The town of Mexico Beach was almost completely wiped off the map. Data assessments from the NWS revealed damage to tens of thousands of structures that were in the path of the storm. "This hurricane was an absolute monster," then-Gov. Rick Scott said at the time. "Homes are gone, businesses are gone. Roads and infrastructures along the storm’s path have been destroyed." 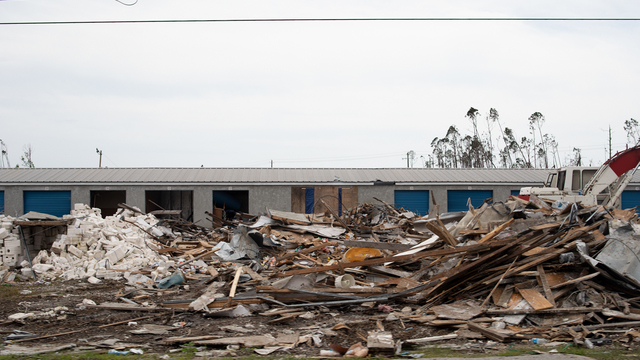 Catastrophic damage was reported at Tyndall Air Force Base - a building that experienced the eye of the storm. A sensor at Tyndall measured a gust of 139 mph during the storm before the transmissions stopped. An estimated 25 million cubic yards of debris were left behind after Michael. "One of the first memories I have was just being in total awe and shock of the devastation it caused," Officer Chaix said. Hurricane Michael knocked out power to nearly 100 percent of customers across a large portion of the Florida Panhandle, the NWS reported. Many families were in the dark for weeks as crews from more than a dozen states worked to clear downed lines, poles and transformers so they could rebuild systems and restore power. The poles and lines knocked down by the storm also caused problems for first responders. "It’s sad to say - when you answer the phone call and say, 'Sorry we can’t come.' But it was virtually impossible because power lines were down and trees were in the street," Marianna Police Chief Hayes Baggett said. "One of the most difficult things for me was to listen to the cries for help and, as a chief, not be able to respond," Marianna Fire Chief Nakeya Lovett said. Communication was also a major struggle during and after the storm due to issues with wireless companies. "Hard for people to call in, hard for people to call out, hard for us to get our calls dispatched to us," Sgt. Nicholas Hall with the Bay County Sheriff’s Office said. "But we're out there taking care of whatever needs we could find. Most everything we dealt with was self-generated, helping people we saw who were having issues." Shortly after landfall, emergency crews from all over the country rushed to the Gulf Coast to search for and rescue any survivors who tried to ride out the monster storm. Authorities have confirmed at least 45 deaths in Florida due to Hurricane Michael. Bay County alone reported a death toll of 25. The county is home to Mexico Beach where Michael made landfall. Jackson and Washington counties both had four storm-related deaths. Gulf County had three deaths. Gadsden and Liberty counties each had two deaths. Clay, Calhoun, Leon, Franklin and Wakulla counties each had one death attributed to the storm. 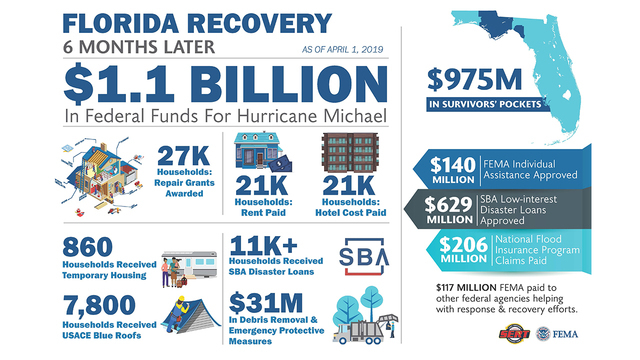 As of April 1, the Federal Emergency Management Agency reports that $1.1 billion in federal funds have been secured for Hurricane Michael recovery in Florida. Survivors have pocketed $975 million. Repair grants have been awarded to 27,000 homes. Rent has been paid for 21,000 households while an additional 21,000 households have had their cost of living in a hotel paid for. According to FEMA, 860 families have received temporary housing. 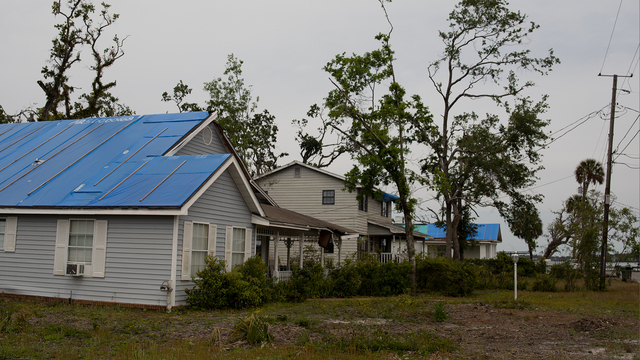 The US Army Corps of Engineers has installed more than 7,800 Blue Roofs since Hurricane Michael. A Blue Roof is blue fiber-reinforced plastic sheeting that covers a damaged roof until permanent repairs can be made. More than 11,000 households have received Small Business Administration Disaster Loans since Michael hit. Nearly six months after the storm, a wildfire ripped through the Panama City area, spreading quickly through dead trees that had not yet been cleared from the storm. The fire burned a total of 668 acres. 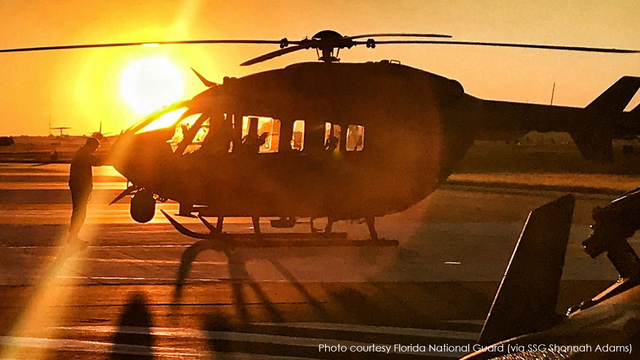 Florida Forest Service officials had expressed concern about the wildfire threat just months before the fire sparked. Forest officials also stated that it could take a decade or more for the state’s timber industry to recover from the nearly $1.3 billion in damage the storm caused. In a report released after the storm, state forest officials reported 1.4 million acres had severe or catastrophic damage. 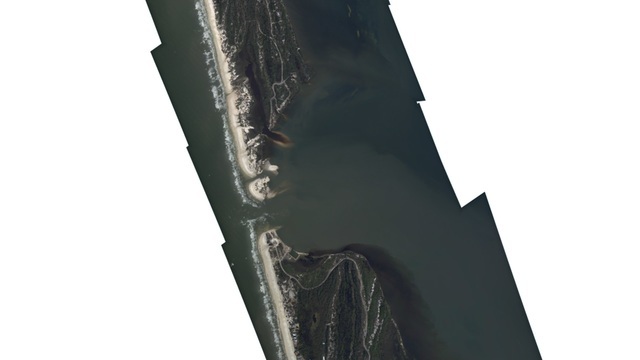 According to the NWS, storm surge caused by Michael cut through the peninsula at St. Joseph Peninsula State Park on Cape San Blas, creating two inlets. Parts of the park can no longer be accessed by vehicle due to the inlets created by the surge. Six months after the storm, Florida Caverns State Park in Marianna and the Three Rivers State Park Camping area in Sneads remain closed. St. Andrews State Park in Panama City Beach and T.H. Stone Memorial St. Joseph Peninsula Park in Port St. Joe are also still working to fully recover. 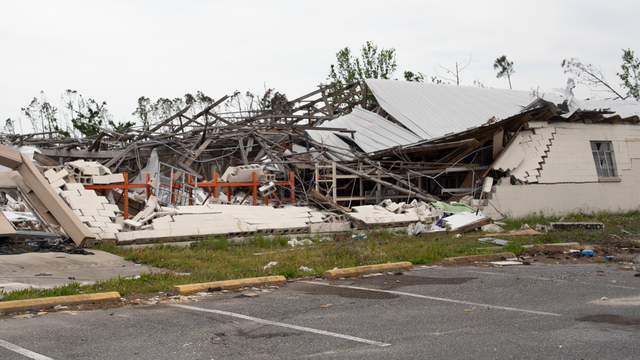 A hospital in the Panhandle was forced to lay off nearly half its staff because of the damage suffered from Hurricane Michael. Bay Medical Sacred Heart had to cut 800 employees when it reopened at about one-fourth its original size. On March 2, almost five months after the storm, the Associated Press reported that many doctors’ offices and retailers still had not reopened in some parts of the Panhandle. 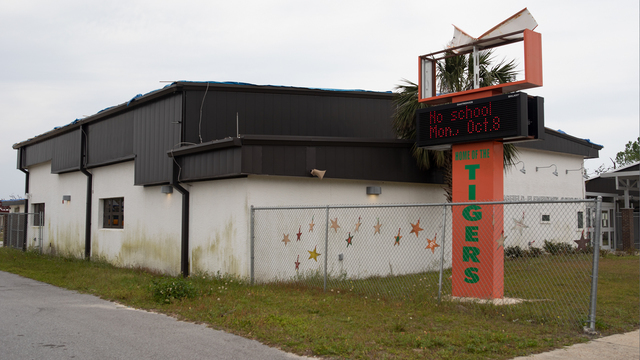 Bay District Schools Superintendent Bill Husfelt told the AP in March that some schools lost more than 40 percent of their students after the hurricane. Enrollment also dropped 14 percent. The school board closed at least three schools in response. State officials say 20 correctional facilities throughout 15 Florida counties suffered a total of about $50 million in damage from the storm. 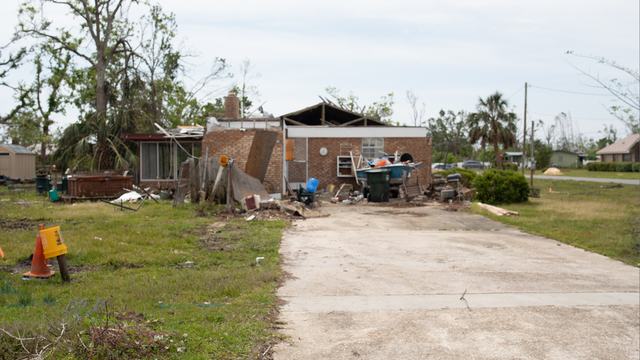 Six months after Hurricane Michael, people in the Panhandle say they feel forgotten. Downed trees remain abandoned in yards. 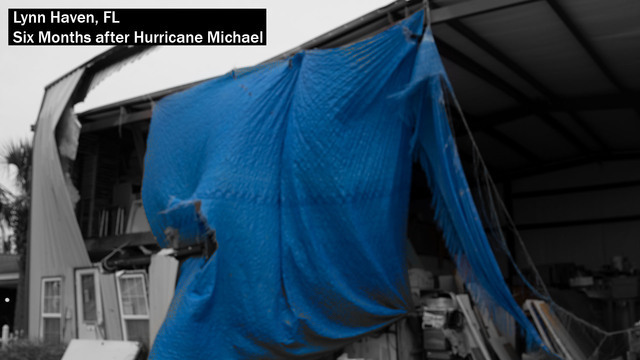 Blue tarps are a common sight as homeowners wait for insurance companies to process claims. The amount of work that needs to be done in the Panhandle has overwhelmed contractors and many residents are finding themselves quoted to have work completed weeks or even months into the future. 23 Photos Copyright 2019 Nexstar Broadcasting, Inc. All rights reserved. This material may not be published, broadcast, rewritten, or redistributed. 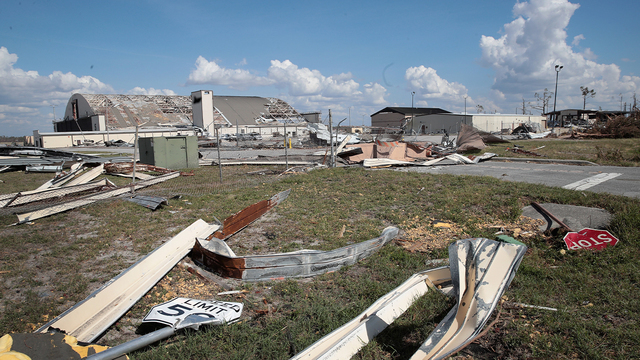 Rubble lies where an entire row of self-storage units once stood in Parker, FL. A heavily damaged second row is visible in the background. 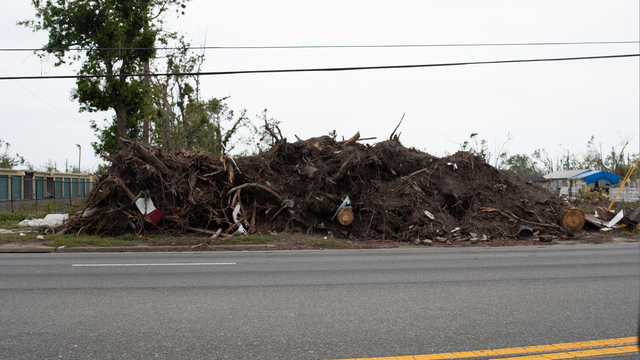 Piles of debris such as this one are a common sight on the sides of roadways. 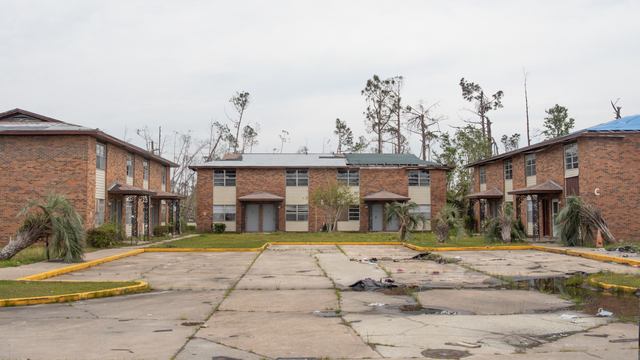 Concrete cinderblock buildings like this one in Parker, FL were no match for Hurricane Michael's 155 mph sustained winds. Springfield Baptist Church, founded in 1943, was once used as an emergency shelter against hurricanes. It was no match for Michael's wrath and is now an empty husk. The congregation attends services at other local churches. Homes with blue tarps is a common sight as residents wait for insurance to process claims. There are not enough contractors to complete the work in the Panhandle. Many residents are quoted for work to be completed weeks or even months in the future. Staging area for debris removal trucks. 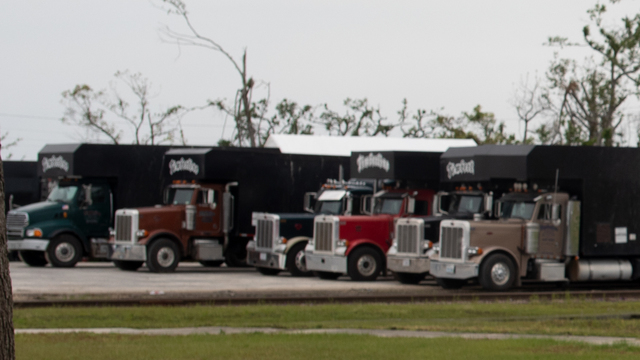 Hundreds of the trucks work around the clock to remove debris in Florida's Panhandle. Power recently restored to the sign in front of Springfield Elementary. Bay District schools have since made the decision to shutter it and several other area schools due to student enrollment decline and lack of funding to repair damage. 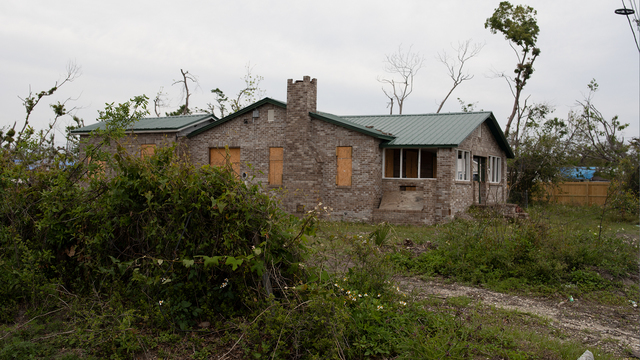 A home is boarded up and abandoned in Springfield, FL. This warehouse served as the distribution center and sorting facility for Goodwill for the area. The walls blew out on the warehouse and operations have no resumed. An apartment complex stands abandoned in Lynn Haven, FL. 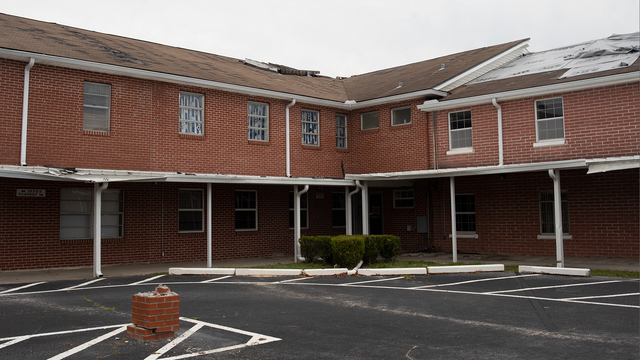 Nearly every apartment complex in Bay County, FL sustained heavy damage and remain in various states of disrepair. A closeup of the Ford Mustang in a warehouse exposed to the elements. 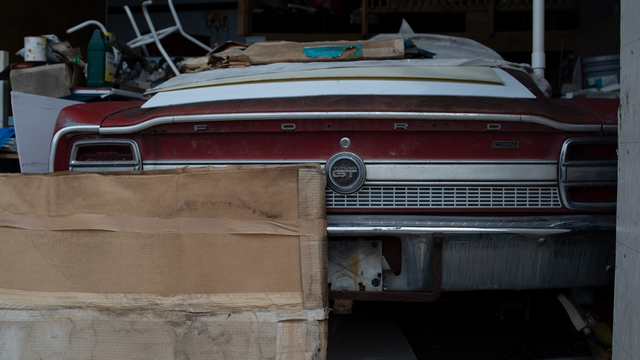 A warehouse used to store personal items stands exposed to the elements, revealing a classic Ford Mustang amid the debris. Lynn Haven United Methodist Church, in Lynn Haven, Florida, is shown in this picture from April 7, 2019. 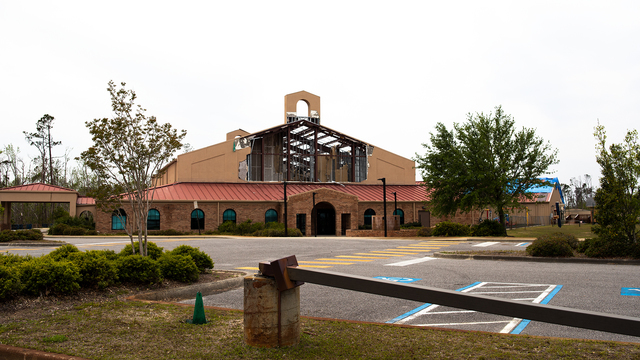 Six months after Hurricane Michael, the congregation is meeting in an alternative location as their main campus sustained substantial damage. A damaged gas pump sits abandoned. 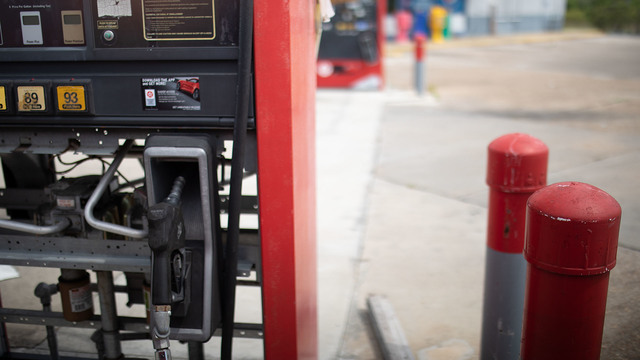 Many gas stations were heavily damaged by Hurricane Michael and only a fraction of those have re-opened, leaving residents dealing with longer lines and further drives for fuel. A root ball of a downed tree lies abandoned in a yard in Lynn Haven, FL. Such sites are common in the Florida Panhandle. The Grocery Outlet closed at 9 p.m. on October 9. 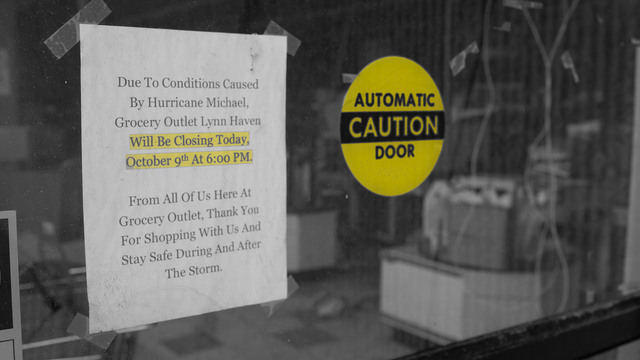 On October 10, Hurricane Michael closed the store forever. A shot inside a grocery store in Lynn Haven, FL. 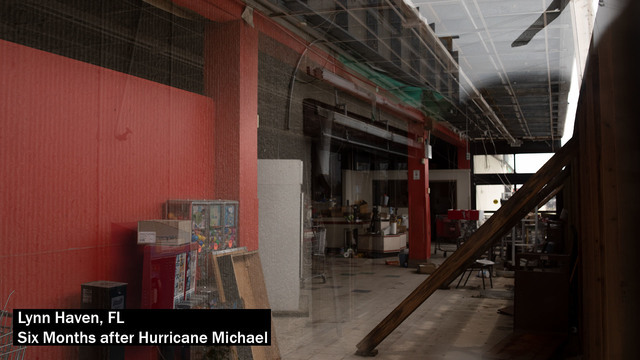 The store was heavily damaged in Hurricane Michael and shows no signs of re-opening. Blue tarps have become a common sight around the Florida Panhandle. This one hangs haphazardly trying to keep the elements out of a small warehouse that's front wall was blown away during Hurricane Michael. Photo taken April 7, 2019. 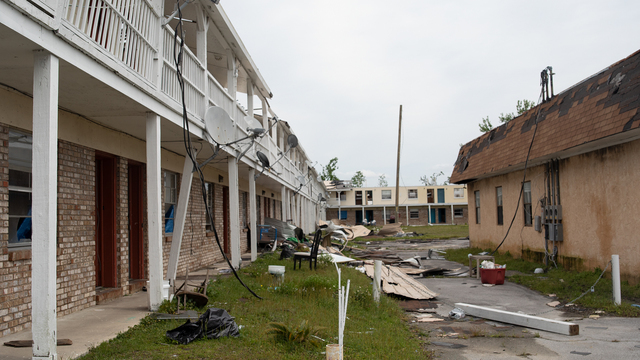 An apartment complex in Callaway, FL that is completely uninhabitable. No progress has been made on restoring this property. A business in a light industrial park remains fenced off with heavy damage. Photo taken April 7, 2019. On October 9, 2018, this was the Callaway location of Sonny's BBQ. 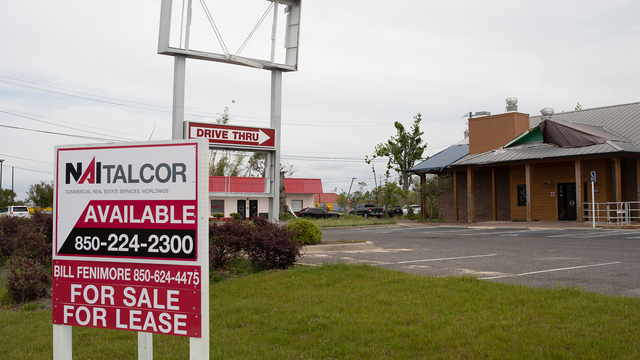 On October 10, Hurricane Michael damaged the business to the point they shut down. Now, the damaged building is for sale. 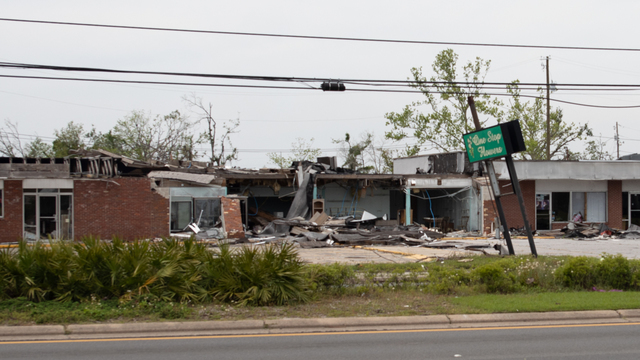 This retail shopping center in Callaway, FL sat in Hurricane Michael's eyewall for over an hour, destroying local businesses like One Stop Flowers, pictured here. The strip mall looks the same now as it did on October 10. Photo: April 7, 2019. Many damaged buildings look the same now as they did in the hours following the storm. 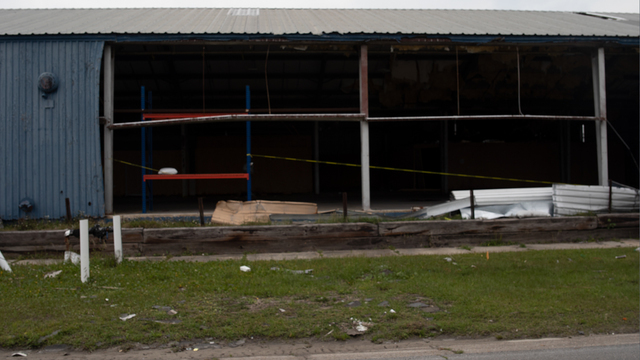 Some businesses were damaged beyond repair and show no signs of re-opening. Only a fraction of the gas stations that were damaged by the hurricane have re-opened. Residents are now forced to drive farther and wait in longer lines just to fuel up. 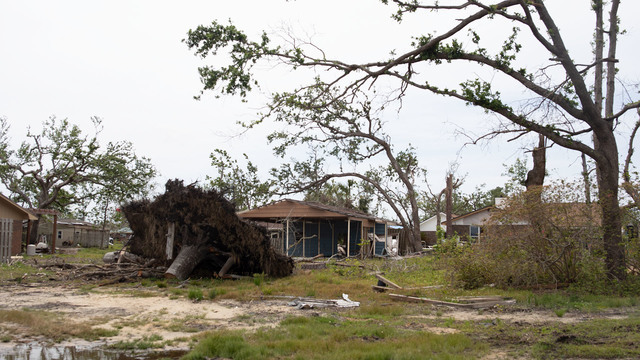 According to the AP, nonprofit organizations and officials in the Panhandle both say funds collected for Hurricane Michael survivors are "well below" the funds that were donated for victims of other hurricanes that have hit the U.S. in recent years. Mexico Beach, the hardest-hit area where Michael made landfall, didn’t even receive its first reimbursement check from FEMA until February, the AP reports. The check was worth $2.4 million. 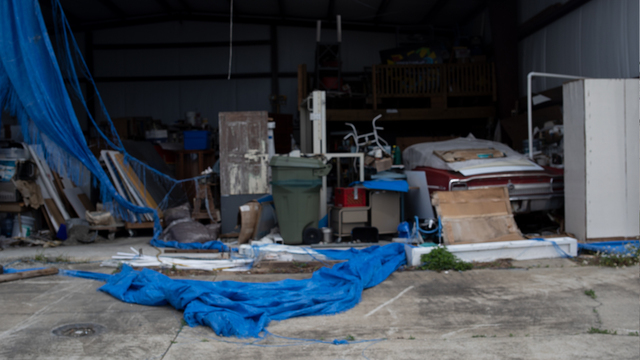 On April 9, almost exactly six months after the storm, FEMA ended its Transitional Sheltering Assistance Program to all but 17 families in Bay County. Almost 280 families were still receiving federal aid through the program to pay for their hotel rooms. They will now have to pay themselves or be evicted. County officials say more time is needed due to the lack of housing available in the Panhandle. Officials with the Red Cross tell the AP they believe the timing of the hurricane pushed it out of the news cycle more quickly than others. Shortly after Michael hit the Panhandle, devastating wildfires started burning in California and national attention shifted to the midterm elections. The location of the storm also may have played a role. Compared to bigger cities in Texas and South Florida that were impacted by hurricanes in 2017, officials say the small towns in the Panhandle that were hit by Michael are lesser known. "We're slowly rebuilding. And it's going to be a long time, a long process and an expensive process," Chief Baggett said. "It won’t look the same in my lifetime as it did on October 9."